These are the most Frequently Asked Questions (FAQs) our office receives. An EL is a student who is an English Learner. They were previously known as “English Language Learners” or “ELLs”. “Emergent Bilingual” is another term for an EL. English to Speakers of Other Languages is a program designed to help students for whom English is not a first language excel. How many ELs are currently enrolled in the School District of Philadelphia? More than 14,000 students receive ESOL services. These students have more than 100 languages among them and represent more than 130 countries. 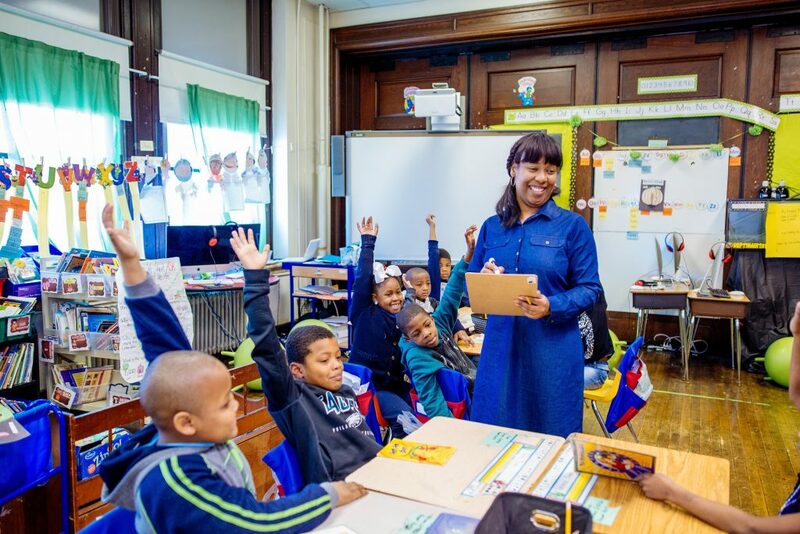 The School District of Philadelphia’s Dual Language Program is a two-way immersion program that provides English Learners and native English speakers opportunities for instruction in two languages: English and Spanish. Students from both language backgrounds are welcome to enroll. Parental commitment to the program will be reviewed with parents at the time of enrollment. The goals of the program are: 1) Foster biliteracy and bilingualism in English and Spanish; 2) Provide a rigorous academic program; and 3) Promote an appreciation of multiculturalism. Which schools offer a Dual Language program? There are currently six schools that offer a form of the Dual Language program in grades K -3. They are: Cayuga School, Alexander McClure School, Southwark Elementary School, Lewis Elkin School, Muñoz-Marin Elementary School and Bayard Taylor School. What is Transitional Bilingual Education program? A Transitional Bilingual Education program (TBE) uses a student’s primary language to develop literacy skills and academic knowledge. The use of the primary language is gradually decreased over time while the use of English is increased. The native language is a bridge to learning. Which schools offer Transitional Bilingual Education? Three schools – Lewis Elkin School, Bayard Taylor School and Alexander McClure School – offer TBE in grades 4 and above. What is the 50-50 model? A 50-50 model is a two-way bilingual immersion program. Students are taught in two languages — Spanish and English – in equal amounts. What is the 90-10 model? The 90-10 model refers to the breakdown of language use during a school year for students whose primary language is not English. The focus is on developing a student’s native language in early grades with the gradual of introduction of English in each successive year. First year students will have lessons in Spanish 90 percent of the time and in English 10 percent of the time. The MAC is the Multilingual Assessment Center, located on the first floor of the District’s 440 N. Broad St. headquarters. The MAC provides an assessment of a new student’s language skills, supports student enrollment and helps multilingual families adjust to the School District of Philadelphia. It also provides translation and interpretation services and connects families with social service support partners in the community. The MAC is able to translate outside transcripts to determine a student’s English skills and equivalent level of education in the US. For more information, go to MAC. The Newcomer Learning Academy (NLA) is a four-year program for high school students who have arrived in the United States within the past year. The NLA is an accelerated and intensive course of study that includes three daily English for Speakers of Other Languages (ESOL) classes. For more information, go to NLA. Does a student’s citizenship status matter during school enrollment? By federal law, schools can not provide any outside agency, including the U.S. Citizenship and Immigration Services, with any information from a student’s school files unless a subpoena is presented. It is unlawful for a school to request a student to produce a Social Security card, passport, or immigration documents. School personnel should also be aware that they have no legal obligation to enforce U.S. immigration laws.